The agency wants to cap commissions, and it might limit referral fees to $100. 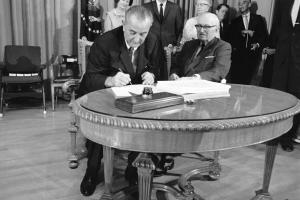 President Johnson signs the Medicare bill. The Centers for Medicare & Medicaid Services (CMS) wants to make big changes in the way private Medicare plans pay agents and brokers. CMS, an arm of the U.S. Department of Health and Human Services (HHS), has included agent and broker compensation proposals in a batch of regulations that are set to appear in the Federal Register Friday. In the regulations, CMS deals with matters such as the rules governing Medicare wellness program incentives and provisions meant to prevent and attack fraud. In the Medicare producer compensation sections, officials talk about how plans pay the agents and brokers who sell Medicare Advantage plans — commercial, CMS-subsidized plans that replace traditional Medicare coverage — and Medicare Part D prescription drug plans. CMS wants to come up with a “fair market value” limit for producer compensation every year, officials say in a preamble to the proposed regulations. Officials suggest that the first fair market value might be $400 per year. A plan could pay a first-year commission that was any amount less than or equal to the fair market value limit, officials say. In the second year and later years, the commission could be up to 35 percent of the fair market value limit in effect during that calendar year. If a producer sold a plan in 2014, for example, and collected a commission equal to $400, or 100 percent of the fair market level, in 2014, and the fair market value level rose to $500 in 2015, the second-year commission would be $175, or 35 percent of $500, not 35 percent of $400, officials say. Today, many plans pay a renewal commission of 50 percent of the first-year commission during policy years two through seven, then a renewal commission of 25 percent of the first-year commission in later years, officials say. Setting all renewal commissions at 35 percent of the fair market value limit would simplify commission calculations. Officials say they also want to cap referral fees for producers at $100. CMS recommended a $100 limit in a memo in 2011. Today, carriers handle referral fees in different ways, and that creates an uneven playing field, officials say. Comments on the draft regulations are due March 7.